Before we moved to Cold Spring, my wife and I lived in Brooklyn. (This is actually a joke in Cold Spring, because if you moved here in the last seven years, there’s an 80 percent chance you moved from Brooklyn.) We had a beater car, an old Mercedes diesel that looked as if it had driven through a roadblock to get out of a city under siege—holes in the grill, the hood ornament gone, streaks of grime—and on the weekends we’d cruise two-lane roads, looking at the scenery and stopping for lunch. One day we found Route 9D, which hugs the river south of Beacon and heads through Cold Spring and Garrison. We must have had a moment of confusion as we drove past the gravel parking lots just north of Breakneck Ridge, where a throng of hikers walked along the shoulder to the trailhead to climb the steepest terrain in the Hudson Highlands. The dramatic rocky cliff is pierced by a narrow strip of asphalt, the tunnel itself so short as to give the impression that the ridge above it must be a veritable knife-edge of granite. I remember clearing the tunnel, and hitting the flat stretch of byway that hugs the shore of the Hudson and grants a view of Storm King and Crow’s Nest mountains across the water. It took our breath away. We imagined, at the time, that the area must be full of railroad tycoons. Who else would have access to a place of such arresting physical beauty, devoid of the sprawl that plagues so much of America? This impression is enhanced by the long driveways and distant mansions of Garrison. 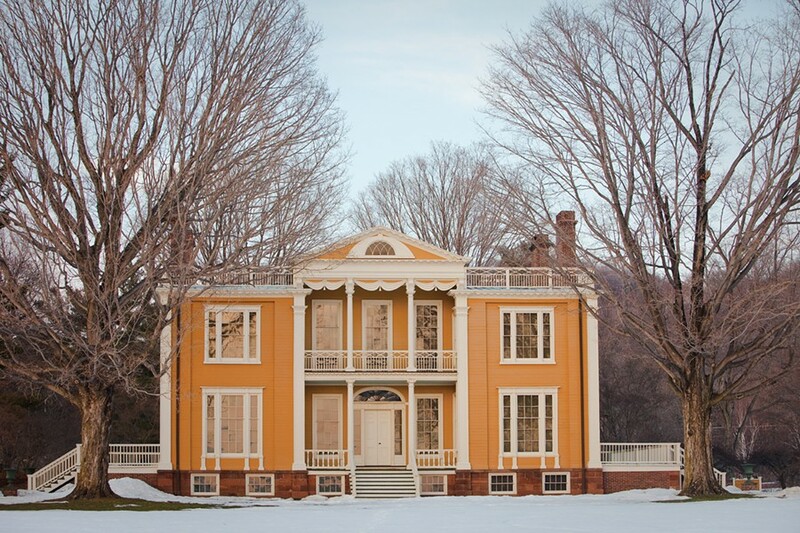 Not so much the sweeping lawns and fences of Boscobel—that’s obviously public, with a big sign announcing the summertime Shakespeare festival—but the towering stones of Castle Rock perched high atop a hill certainly look imposing. Castle Rock was, in fact, the home of Illinois Central Railroad president William H. Osborn and his family. They also built another grand, rocky house nearby (now available for weddings) called Cat Rock. In Cold Spring, however, the houses are small. They are not extravagantly expensive. When we decided to move out of the city, we wanted most of all to live within walking distance of the train station, and we made that our highest priority. I work at home, but my wife works in the city, and we knew that her trip to town could define our life. Because of that, the vibe of the town was almost an afterthought, though it quickly enchanted us. 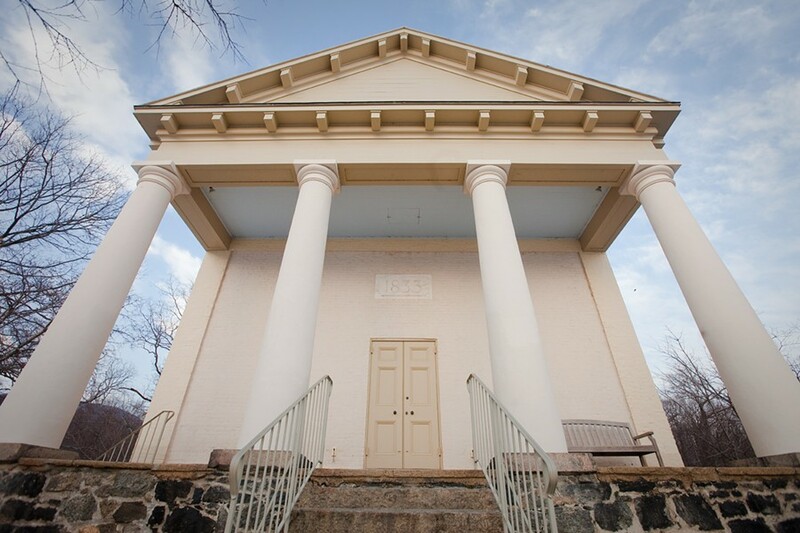 Chapel of Our Lady of Restoration in Cold Spring. 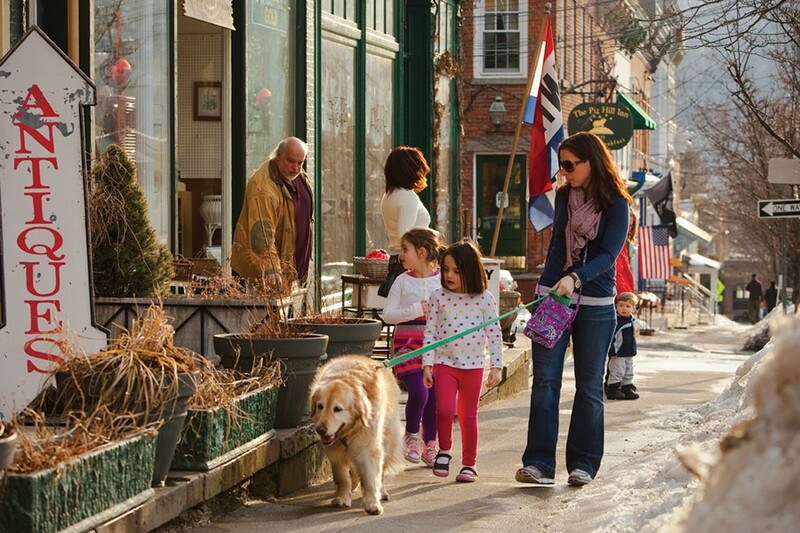 We’d come up to Cold Spring and eat at the Foundry Cafe on Main Street—a colorful and comfortable, veggie-chili-and-chunky-coffee-cup-type place where it was obvious that everyone knew one another. We’d grab a sandwich at the Italian deli next to Cold Spring Pizza and walk down to the river and eat on a bench, watching the boats rock at the Boat Club docks. I once came up alone on a chilly weekday in November, and the silence frightened me. You could have rolled a flaming tire down Main Street without affect. Mostly, however, we were excited: We’d walk the narrow streets and look at the tiny, 19th-century houses, with their faded paint and their muted colors. It felt like we’d found an American version of a town on the Cinque Terre. We’d honeymooned on that Italian coast, and that was basically the highest compliment in our quiver. We wanted the physical beauty, and we loved the house we found (and still do). The train station was only blocks away, and we could walk to a Chinese take out joint (which we figured might ease the transition away from the city). But we knew very little about the community, and we were nervous about what we might find. Cold Springer Sharr White (whose play “The Other Place” opens at the MCC Theater in Manhattan on March 11) expressed his former anxiety by pointing out to me that when he moved here from DUMBO with his wife and oldest child, they didn’t even know where to buy groceries: “We didn’t know where FoodTown was, that’s how completely unprepared we were,” says White. Shelly Boris at Fresh Company in Garrison. Rebekah Tighe grew up in Cold Spring and lives here still. 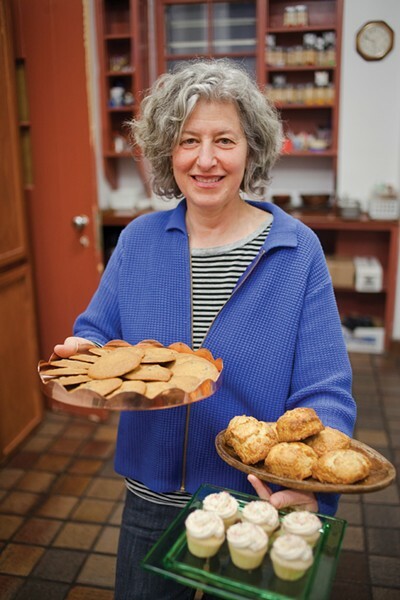 She is a baker with a local caterer, Fresh Company, and during the warmer months she and writer/director Ivy Meeropol run the Sunset Reading Series at the Chapel of Our Lady of Restoration, perched on the bank of the river near the train station. Tighe was quick to remind me that those of us who came here from Brooklyn did not invent the town. Although it has a reputation as having been a tough, blue collar place, she describes it differently. 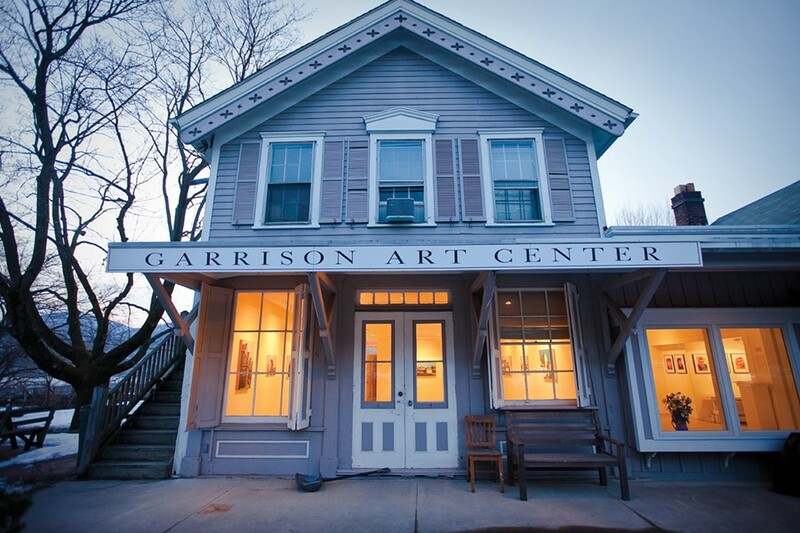 “The Chapel of Our lady was bought then restored in the 1970s.” She’s right: The Garrison Art Center held its 41st Fine Arts and Crafts fair last summer, the Philipstown Depot Theatre started in 1996. That means plenty of arts programs, and lots of local involvement in politics and the environment, a strong farmers’ market. It means a customer base to support the Riverview Restaurant’s Home Chef shop, tucked away in the back like a speakeasy and carefully stocked with superlative fish and meats. It means that Hudson Hil's—a sunny little restaurant with a shop that sells prepared foods and specialty items—is filled everyday. A town in flux is bound to be a town with some tension—as covered in a recent issue of The New Yorker—and one sees grumblings in the Putnam County News and Recorder or on Philipstown.info about carpetbaggers. Max Watman’s Chasing the White Dog: An Amateur Outlaw’s Adventures in Moonshine, has just been released in paperback.